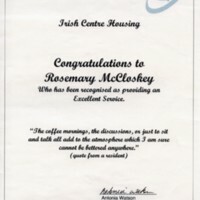 This was awarded to Rosemary McCloskey who worked in the Irish Centre Housing organisation in London. 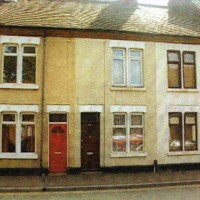 This is a picture of the house that Rosemary bought when she lived and worked in Nuneaton. She lived there for almost two years then sold it and returned to Belfast. We got an odd newspaper from England but us children were not allowed to read it. I usually got my hands on it (News of the World) and read it thoroughly. All I could see were one or two pictures of so called glamour models. It seems like the other day when I landed at Heathrow Airport in a beautiful summer day on 3rd of June 1961. Both of us were young with two small children and very little experience of life and specially about the western world.